I’ve just started Mastered ecourse on the Business of Embroidery taught by the amazing Karen Nicol. I’ve been looking for a while for an ecourse to take as research towards developing my own ecourses and had been pondering one of the Mastered embroidery courses, though I knew they weren’t quite right for me. It has been at the back of my mind for a while that I want to explore designing embroidery and embellishment commercially, so this course was just the right thing at the right time. I’ve chosen to work around the theme of fairytale forests, the dark, dark woods full of faeries, goblins, monsters, witches and my beloved trees. 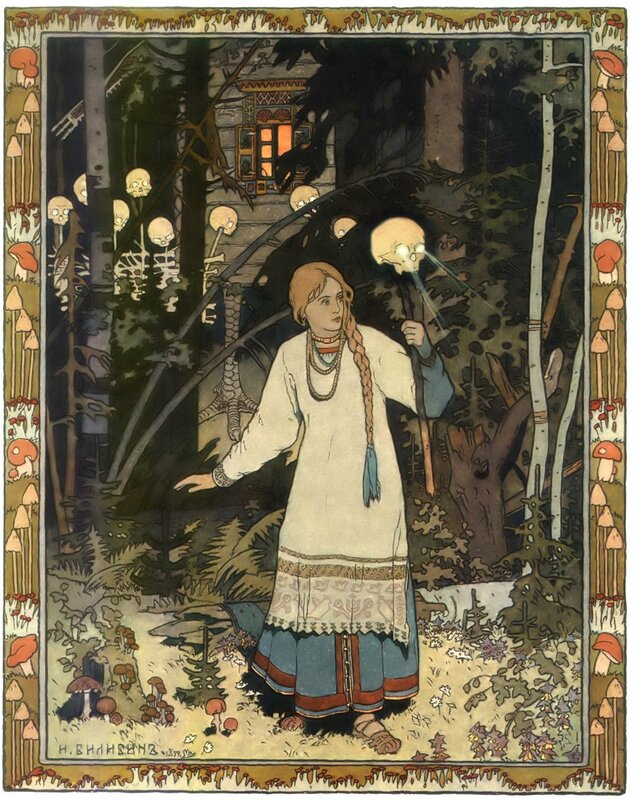 The first image that came to mind was one of Ivan Bilibin’s illustrations of Russian fairy tales which I remember from my childhood. My mum recently gave me her copy and it is in my pile of prints to frame. Magical fairytale forest in action. I’m gathering images on Pinterest and have started my sketchbook, although as yet it is a little sparse. I am enjoying forcing myself to do the research properly and not start putting needle to fabric just yet. I’ll post more images as the work develops. I have 2 or 3 reprints of Ivans work and so love them,so mixing his influences into your theme will be fascinating to watch. Ivans trees made me actually look at trees ,if that makes sense . That completely makes sense Faye. I love stylised trees of any sort. How exciting, I look forward to seeing how this works for you. I hope you will show some of your sketchbook progress too.